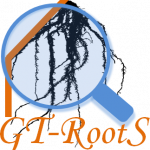 GT-RootS (Global Traits of Root System) is the automated Java-based open-source solution we develop for processing the root system images coming from the Rhizoscope, a Cirad’s phenotyping plateform dedicated to adult cereal plants. 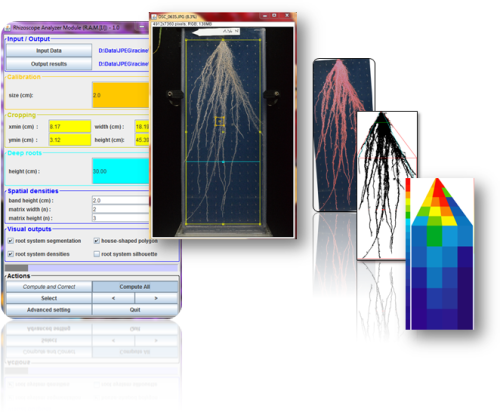 GT-RootS combines local adaptive thresholding algorithm and similarity indicator to automatically separate root system from complex background without user intervention. A covering house-shaped polygon is then defined in the inertia axis system of the root silhouette from vertical weighted density profiles. This canonical shape is composed of both upper trapezoid and lower rectangular compartments from which upper and lower heights, global width and local offset, root system cone angulation and spatial densities can be easily evaluated and displayed. Borianne, P. ; Subsol, G., Audebert, A. (2016). Automated Characterization of the Mature Root System Form by a Double-Quadrangle-Shaped Polygon. IEEE International Conference on Functional-Structural Plant Growth Modeling, Simulation, Visualization and Applications (FSPMA), Qingdao, China, pp. 6-15. doi: 10.1109/FSPMA.2016.7818282. Bienvenue sur le site des logiciels développés à l'Umr AMAP.